Contemporary wardrobe styles are all about simplicity, minimalism, keeping things light and cool. 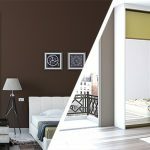 Which is exactly what you want in the bedroom, the one place in the house where you really want to feel a sense of space. 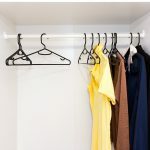 It’s also a great way to adjust to smaller spaces, or unusual room shapes, as the clean lines of contemporary wardrobe designs lend themselves to a variety of possibilities. However, that doesn’t mean you can’t get bold, or add a little drama to your style. 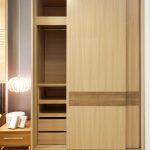 These modular wardrobe designs maintain the simplicity of contemporary styles, while still adding a dash of colour or detail that makes for that touch of individualism. 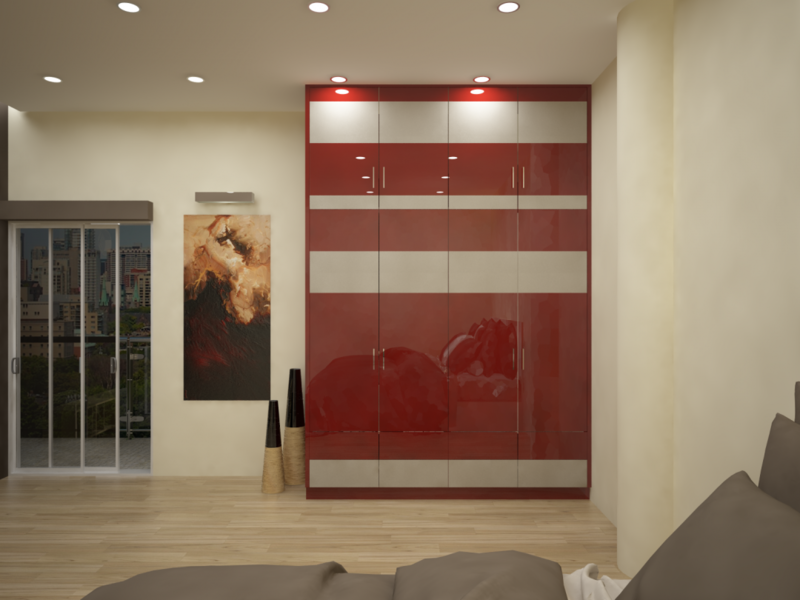 With horizontal paneling and minimalist design, this modular wardrobe adds a spark of difference with the striking red colour, balanced with silvery grey. It’s all about contrast, and you can take some bold steps with your furnishings, keeping this in mind. A high-gloss finish keeps the look modern. 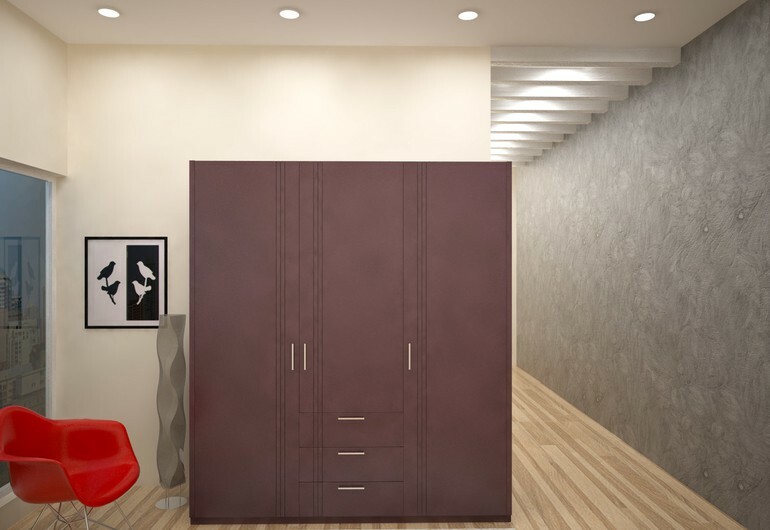 The bold black-currant shade of this modular wardrobe is softened with a ‘suede’ finish, giving it a wonderfully distinct and yet subtle style. The grooved patterns maintain a geometric harmony, and when you decorate, you can either complement or contrast the colour, based on your mood! 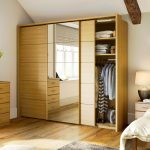 A light oak wood finish creates a neutral impact in this contemporary-style wardrobe, that allows you to mix, match and decorate with ease. The geometric grooved pattern provides simple, non-fussy detailing that reinforces the style without making waves about it. 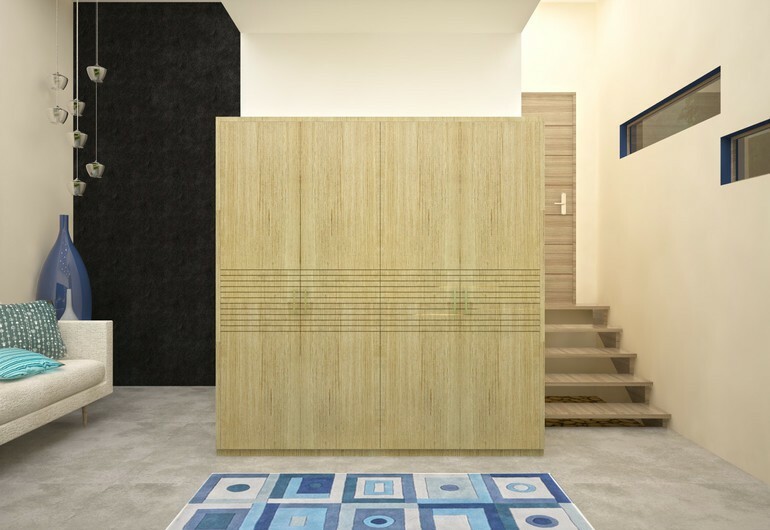 This modular wardrobe design maintains a simple, geometric style in a delicate blue shade that’s bound to give you plenty of joy in matching curtains and bedspreads. With a high-gloss finish, the overall impact is sleek, refined and effortlessly modern. Black is one of the easiest colours to decorate with, just like it’s one of the easiest colours to wear. Use light shades of furnishings to soften the impact, or bright colours for a bit of drama. The high-gloss finish takes away some of the weight of the colour, so you don’t have to worry too much about it darkening the room. This is also a truly modern design, so if your aesthetics swing that way, you’ll find it complements your home perfectly. 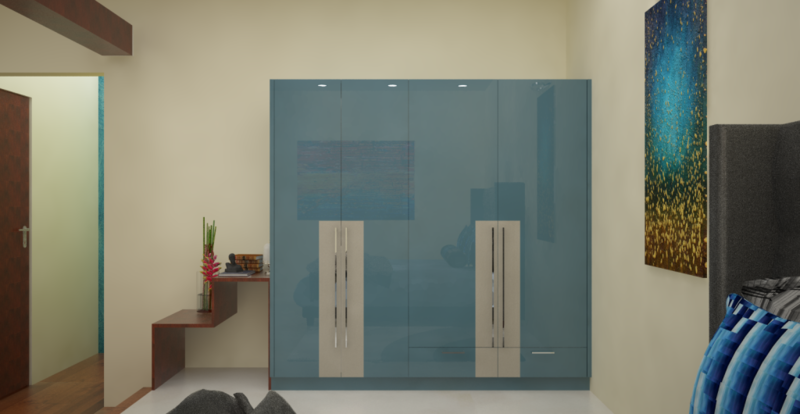 For more contemporary-style wardrobe designs, visit us at HomeLane.com. We create customized fixed furniture to fit into any style or space.